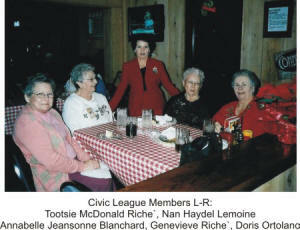 Members of the Evergreen Civic League attended the Evergreen Christmas Social at Rocky’s in Bunkie on December 11, 2008. The atmosphere was buzzing with excitement as daylight that morning was greeted with a light snowfall. Not included in the picture is Civic League Treasurer, former Mayor Nettie Jans, who was also in attendance.